We provide a variety of pond construction and pond maintenance services to help transform your landscape into a personal water feature oasis. Enhance your current landscaping with the soothing sight and sound of a waterfall. Enjoy watching butterflies and birds flock to your fountain for a little refreshment. 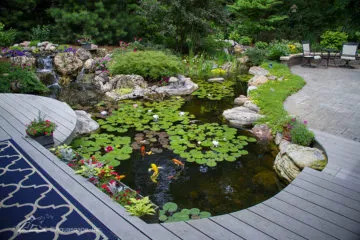 From new ponds to existing ponds that need a facelift, our professional pond design and construction installers can help. 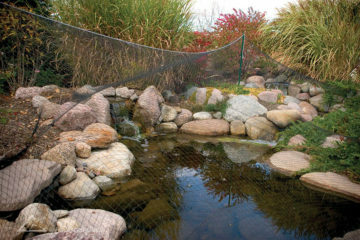 Aquascape is the leading pond construction and water features company in Chicago servicing the entire Chicagoland area. Aquascape Construction is a full-service water feature company that provides custom installation of ponds, waterfalls, decorative water features and more. To help with your maintenance needs, Aquascape Construction offers seasonal maintenance packages, including spring cleanout, fall shutdown and winter maintenance. Every autumn falling leaves are inevitable, so it’s best to be prepared and minimize the maintenance you’ll need to do in the late fall and early spring. best option for the highest quality in water feature installation. 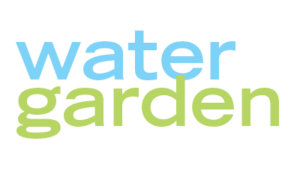 Aquascape Construction is located in St. Charles, Illinois, the Water Garden Capital of the World. Our ponds and water features have been featured on the cover of Architectural Digest magazine, in addition to having our water garden designs appear in the pages of Better Homes & Gardens special interest publications, Nature’s Garden, Irrigation and Green Industry News, and more. Stop by our Aquascape Water Gardening Store in St. Charles, IL for all your pond supply needs and to view our inspiring outdoor paradise! When you have your water feature installed by Aquascape Construction, you can rest assured you're hiring the most qualified and experienced crew in the industry. Brian, Ed, and Chris share a unique passion for the artistry and environmental aspect of ecosystem ponds, waterfalls, and decorative water features. 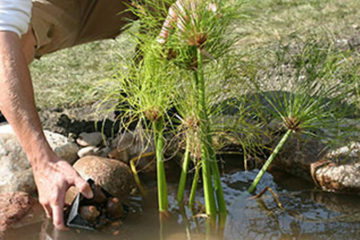 Together, they've trained thousands of water feature contractors from around the world on the Aquascape ecosystem method. Aquascape Construction offers a variety of water feature installation options for your residential or commercial property. From ecosystem ponds and waterfalls to fountains and rainwater harvesting systems, we’ll show you how to integrate the water feature into your surrounding landscaping, keeping the big picture of your entire yard in mind. Aquascape Construction has been in business for over 25 years, and offers more than 50 years of water feature design and installation experience combined. Over the years, we've installed thousands of water features throughout the Chicago area and beyond. Aquascape is a trusted resource for small and large projects, alike. We've installed water features in notable locations such as the Shedd Aquarium, Lincoln Park Zoo, Brookfield Zoo, Phipps Conservatory, and more. We have had nothing but positive reactions to our pond as it was designed and built to fit into a normal-sized lot, and visitors love that we’ve created a multi-faceted water feature that fits nicely onto our property. The seasonal changes provide ever-changing interest, from the rain dancing on the water in the spring to the underwater lights glowing through the ice in the winter to the reflection of autumn colors. We have a water feature because I am a gardener. One main purpose was the rainwater storage so I can irrigate the garden and conserve resources. I can honestly say that a well maintained pond is easier to care for than a lawn. We particularly enjoy our ability to eat and drink next to the waterfall during the summer months and to observe the changing of the specimens with each season, like watching the summer flowers expertly tucked in within the crevices of the water feature, seeing the swaying grasses during the fall, and watching the contrast of the evergreens against the snow-capped rocks of the waterfall during the long winter months. It brings my spouse and me great joy! We are at our ‘summer home’ just steps outside our back door. We have friends over who can’t believe we have such a beautiful water feature in our backyard. We were gardeners first. The water feature has expanded our interest.